Here in The States, we have a holiday coming up. Summer holidays are often celebrated outside in community. 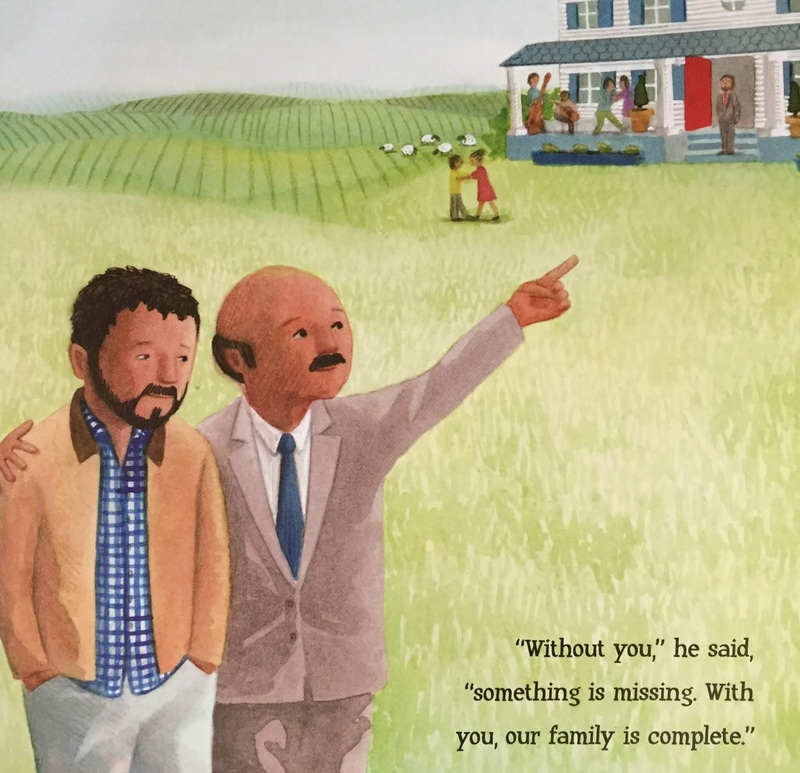 This picture book is about one neighborhood's strange, unexpected gift. One young leader helps them choose to be open to its possibilities and come together to bring about positive change. It has all sorts of applications for faith communities too! Summary: This story begins at little Stella’s house where an abandoned bus appears with no explanation. Taped on the front is a hand-painted saying “Heaven.” The community stops their hurrying by and gathers to puzzle over this strange gift. Stella says it's as sad as an abandoned whale. She goes inside and finds trash, debris, and possibilities. Stella says to her neighbors, "It could be ours." Stella's mom determines that it needs to come off the road so together they roll it into Stella's yard, but it still sticks out some. There is work to do: clearing & scrubbing. After some graffiti artists leave their mark, they are recruited to "make the whole bus sparkle." Stella gives them some of her art to copy. Soon Heaven becomes a second home for neighbors who had never spent all that much time together. Life returns to the bus. Because Heaven sticks out onto the sidewalk, it must be towed. They follow Heaven to a new home and lament. The junkyard boss shows the regulation, "Thou shalt not park on the street," and proclaims that Heaven is headed to the crusher. Stella challenges the driver to a Table Soccer game. If she wins, she gets the bus. After showing the driver, a new family of birds living in Heaven's engine, the driver explains the bus must be moved to a private space. Little Stella has an idea and all push Heaven to a new home in the vacant lot behind Stella's house. All are worn out, but they're worn out together. Once they recoup, there is music and dancing! Heaven for sure! Hanna’s Comments: A community is transformed, and a little girl finds her voice. Concepts of heaven and the Kingdom of God are all over this book as are allusions to the early Christian church's inclination to share and Jesus' teachings about loving neighbor. All of these ideas are potential for great conversation with a group of children or adults in loving faith community. If you have a big change, here's a tool for exploring meaning and possibility. If your group needs to be motivated to invest in their surroundings, this book could begin a conversation. Be specific about the differences the bus made for individuals, not just the group. Also, talk about creative problem solving being sourced by God. Emphasize the kindness and gentleness modeled in these pages as opposed to the rudeness we sometimes see in the media and even in communities of faith. Idea(s) for Application: Read this book to a group of adult leaders in a church who are dealing with a significant change. 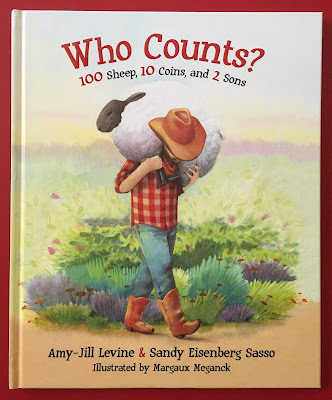 This and the next PBT post feature a couple of authors who bring with their picture books a great deal of substance and authority. Levine is a Professor of New Testament & Jewish Studies at Vanderbilt University. Sasso is a well-known rabbi and author of many books for adults and children. 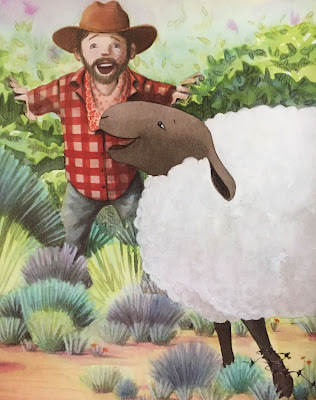 You’ll find my favorite Sasso picture book in a couple of versions [here] at PBT. My photos below are from a pre-publication copy of this book so they may not match what you find. 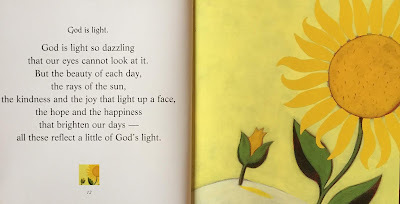 Summary: This book is based on the parable Jesus tells about a mustard seed. Together two children plant a seed that has great potential even though it is very tiny. They tend it in rain and shine. All it's really good for is planting. No matter the weather, it will grow. The critters in the soil see it growing. This tiny seed becomes an amazing tree where birds nest, people marvel, and all enjoy it and each other. Some people touch this great tree to be assured that it's real while others simply enjoy its shade. The marvelous thing about this tree is that it has so many uses. Besides its beauty, shade, and gathering space, its pods can make spices and its leaves and seeds can make medicine. This tree is a symbol of The Kingdom of God, growing and growing, and growing! Now you can't miss it! The Kingdom of God is a great big surprise and marvelous wonder! Like this extraordinary tree, it leads us to "imagine what can be." Hanna’s Comments: The scholarly grounding of these 2 authors becomes obvious in their Note to Parents and Teachers at the end. Be sure to read it. They explore the concept of parables and how they would have been received when Jesus spoke. They offer some of the many interpretations of this parable. Then they list a series of questions and ideas to consider with your audience. Scripture Connections: Jesus’ parable of the mustard seed is found in Matthew 13:31-32, Mark 4:30-32, and Luke 13:18-19. The Matthew and Luke passages mention the seed becoming a tree. 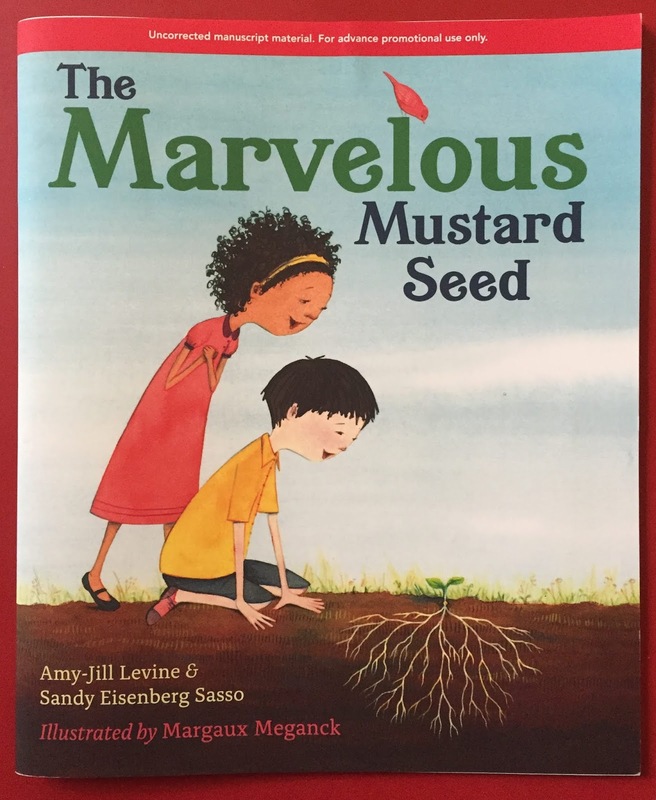 Idea(s) for Application: Read this book to a group of any age or use it in a children's sermon experience to explore the meaning of the parable of the mustard seed. They have drummed, sung, danced, created visual art, and entered a transformed room where a Bible story or concept came alive for them. My husband Bill writes & plans the Bible Story curricula and is their lead playmate during this time. Ask most kids what their favorite Arts Camp experiences are and they’ll say Bible Story because of the novelty and affirmation received thanks to my husband. This year's theme related to flight so science and history were highlighted as well. 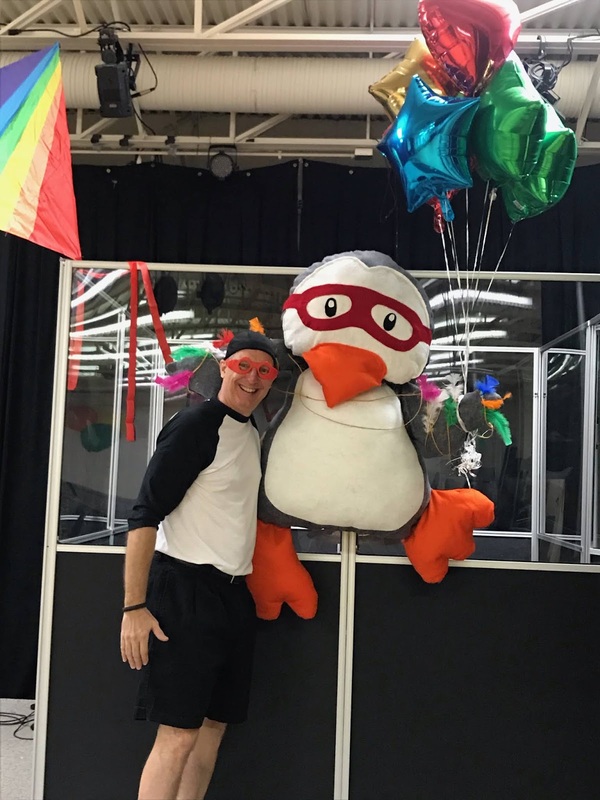 This time Penguin’s eventual fall did not bother him for he had “soared on the wind.” He went home and soon returned with another, even bigger challenge for the flight school teachers. How does this inspiring book fit with theology? 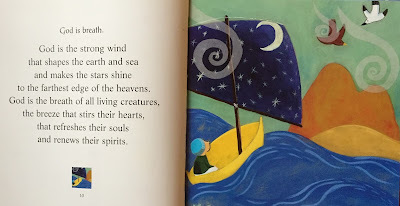 How about reading this book to children and attaching it to Isaiah 40, a verse often heard by children but rarely explained. You could also focus on the benefits of community and friendship for encouragement and helping us soar into our dreams and vocations. 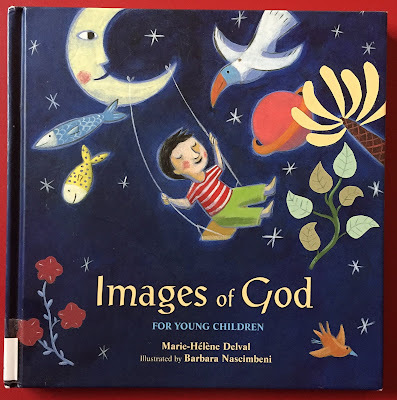 Connect with the body of Christ imagery that Paul gives and you’ve got many potential scripture connections. Yesterday, I heard a friend preach on laity Sunday. 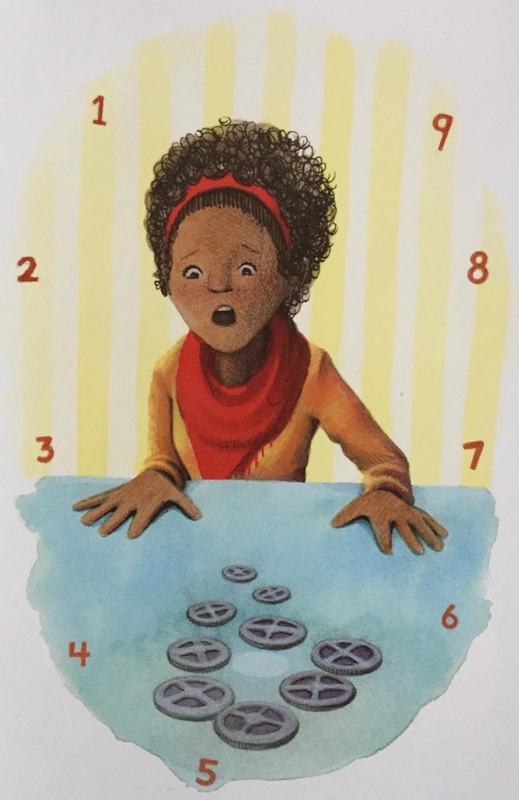 She might think of herself as ordinary, but she declared in an extraordinary way that God is a God of multiplication! This PBT post is inspired by her. 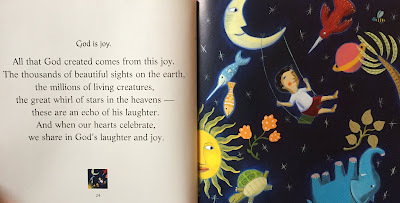 Summary: This story will inspire you and your kids to bless the world! It begins with a random act of kindness. 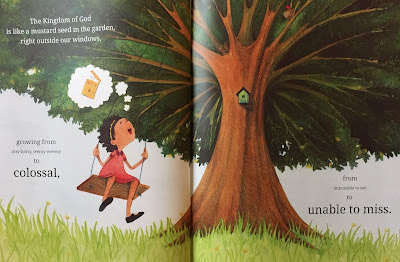 Ordinary Mary sees an ordinary blueberry bush and picks ordinary blueberries for her neighbor. Mrs. Bishop is delighted so she responds with her own act of kindness: blueberry muffins for 5 friends. The number 5 is important in this story. You'll see why later. 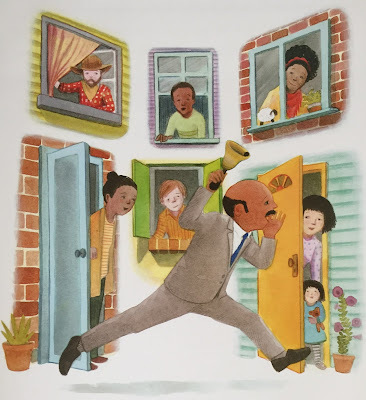 One of Mrs. Bishop's friends is her paperboy Billy. Instead of throwing papers in the bushes, that morning he hand delivers them. Mr. Stevens, who is leaving on a trip, receives his paper from Billy and is inspired to smile the entire 10 hour trip and help 5 people with their baggage! Maria and her little boy James are glad for Mr. Stevens' help and smile. Maria and James spread the joy to 5 people while shopping. They give some oranges to Joseph who shuffles to his bus with a full heart. Sarah's heavy bag breaks so Joseph gives her a new one that he has made. Sarah decides to shine on 5 people today. On a boat, Sarah encounters a very sad Sophia. Sarah compliments Sophia on her beautiful blue eyes. Such an affirmation has Sophia calling 5 people to show her love, including her son Tom. Tom decides to give 5 balloons to 5 children who are his patients. One of them is Peter who is thrilled with the balloons. While on his way, Peter helps Eric, a teenager who is struggling with groceries. Eric is so relieved he vows to help 5 people. His sister Di is the first. He teaches Di to ride his skateboard. Di decides to be a friend to 5 people that day. She chooses to buy a lunch for Louise, a homeless woman in the park. Believing she has nothing to give, Louise still determines to give something to 5 people. When she finds a wallet and returns it to the owner, Mr. Taylor gives Louise a job in his store. Also, Mr. Taylor gives a theatre ticket to Kate, a tourist who's heart was set on seeing a sold-out show. Kate is so inspired she vows to give 5 gifts. One gift goes to her little niece, Mary - Ordinary Mary! It's a circle story! How can this be? Multiplication! Mary's gesture led to a response to 5 people who all responded likewise, exponentially! Mary's small and random act of kindness grew and grew and grew! In 16 days, Mary's generosity had spread to every person in the whole world. That's how Mary's ordinary love spread in such an extraordinary way. Hanna’s Comments: I took these photographs a while back and had an earlier version of the book. Try to find the 15th anniversary publication (published in 2002 or later). In that version, some characters' gender, name, and ethnicity have been changed to reflect a diverse global view. Such characterizations better demonstrate God's extraordinarily diverse humanity. Earlier at PBT, I featured a book with a similar but simpler plot. You might want to read that post and consider Glenna's Seeds. 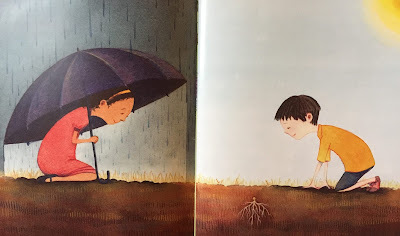 There I also mentioned another similar book: One Good Deed. You have several options with this theme of God's multiplying ways. Idea(s) for Application: Read this book to a group of children in your faith family and talk about how God might help them bless the world. Their acts of generosity and love paired with God's multiplying ways can spread farther than they can ever know.